It’s every musician’s dream to write a song that will last forever. The impulse transcends all known genres, whether you seek fame or not. I don’t care where you come from, if you’re writing a song, you want it to be heard, by as many people, and as many times as possible. Just one song, please God, just one song! Be careful what you wish for though. It could be that the universe will over-hear and grant you your one wish. And what must that feel like? Initially, it would be the greatest, I’m sure. But what comes after? Can you live with just that one hit, for real? Will you hang up your guitar, peacefully, and let the rest of the world have a crack at it, satisfied with your small piece of the puzzle? Or will you chase the dragon until you’re too old to keep trying, from the big gigs in the beginning, all the way down to the last days of the county fair circuit, playing that one song over and over and over again? That one song, the same one you’ve come to despise by now, will end every show you ever play for the rest of your life. Is it worth it? I wouldn’t know, ask Rick Derringer. Have you ever heard Thunderclap Newman? You probably have. Well, one song at least. It’s been used in movies and commercials. And if you haven’t heard them, here’s your chance to add just one more song to your iTunes library. Don’t worry about clearing out space on your hard drive to make room for the hits that must have poured out of the great band responsible for the track I want to play for you, it’s gonna be just the one song in the Thunderclap Newman folder. The first time I heard it I was driving. I had a 1980 AMC Spirit, and I was steering it boldly through a brutal New England snowstorm, on my way to a show. I forget who was playing, but I was late, having just left a crappy food service job. The tape player in the Spirit had died before it ever got to me, so I was at the random mercy of FM radio. The drive to New Haven, Connecticut from where I was, usually took about 45 minutes. In the storm it was a two-hour ordeal. At best, I might get to see the last band play half a set. The plows weren’t out yet. The snow was coming down hard, and wet, with the cold freezing it to the windshield as fast as it could fall. As late as I was, I didn’t have time to stop, so every couple of minutes I would reach a hand out while I was driving and chip a fresh looking-hole into the iceberg growing on my windshield. About three quarters through the trip I heard “Something in the Air” for the first time. It was crammed between two other classic rock staples, probably Foghat’s “Slow Ride”, and Edgar Winter’s, “Frankenstein”, but I don’t actually remember. What I do remember is saying out loud, “What the hell is this?” How could I have missed a song this cool for so long? I pulled over immediately. The Spirit was loud, really loud, and I couldn’t hear the song over her engine, so I made a choice. I pulled into the first gas station I passed by and shut old Bessie down for a better listen. After it was over I was anxious to hear the name of this great new/old track. But the D.J. kept the “No-Repeat-Non-Stop-Rock-A-Thon” going on for longer than I was willing to wait, and I continued on my way. When he did finally do another air check, the motor drowned out his laid-back, low-toned voice, and I was already forgetting the lyrics and melody by then. I got to the show, just as it ended, and started asking some of the older guys if any of them knew the song I had just heard. I had almost nothing to give them. “Calling…something…something…because there’s something…something…something”. Eventually I ran into someone who deciphered the code for me, instantly, upon hearing it. 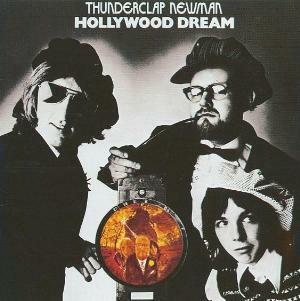 “That’s Thunderclap Newman”. They never did anything even approaching this track again, but it’s enough, for me. I hope it was for them. The “Best Of” for Thunderclap Newman is probably just as long as the one for Steelers Wheel. We should start a category for one hit wonders. Good post Orie.